Fat and oil is essential to your health because it supports a number of body functions. But there is a dark side to fat too- primarily, because of its ability to lead to lifestyle diseases like obesity, cancer, and cardio vascular problems. Now, there are a variety of oils available in the market and this is making it very difficult for consumers to choose the right one. 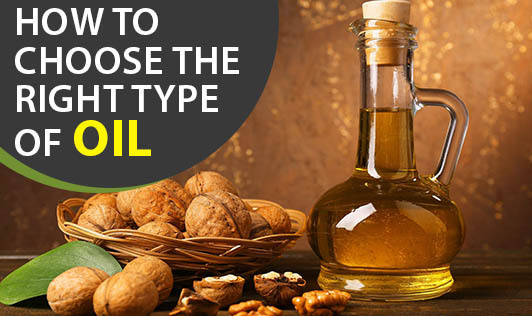 Some of the edible oils include: olive oil, palm oil, soybean oil, canola oil, coconut oil, corn oil, sunflower oil, safflower oil, peanut oil, sesame oil, vegetable oil, and rice bran oil. It is a confounding task to choose the right one every month. Saturated & Trans Fats: Coconut oil, palm oil, ghee, butter, and margarine classify as saturated/trans fats. These raise the total blood cholesterol as well as LDL (bad cholesterol) and prolonged usage can have a bad impact on the heart leading to atherosclerosis and other cardio vascular diseases and raise the risk of developing type 2 diabetes. Polyunsaturated Fats: Sunflower, soybean, vegetable, and safflower oil are sources of PUFA. Polyunsaturated fats improve blood cholesterol levels, and can decrease the risk of heart disease and type 2 diabetes. They may also protect against irregular heart rate and help lower blood pressure levels. Monounsaturated Fats: Olive, rice bran, peanut, sesame, and canola oils are good sources of MUFAs. Studies have shown that eating foods rich in monounsaturated fats improve blood cholesterol levels, and can decrease the risk of heart disease. Read food labels and ingredient lists carefully and avoid products with partially hydrogenated vegetable oil listed among the first few ingredients. Check for the amount of unsaturated fats in the labels. Always choose monounsaturated and polyunsaturated fats for daily cooking to garner the best benefits. Focus on reducing foods high in saturated and trans fats. Keep changing oils every month to acquire maximum health benefits from all. Don't go overboard even on healthy fats. All fats, including the healthy ones, are high in calories. So try and consume natural sources of MUFA-rich and PUFA-rich foods instead of other fatty foods. As a rule of thumb, remember that moderation is the key to good health! every month to acquire its health benefits. But there is a word of caution - don't go overboard even on healthy fats. All fats, including the healthy ones, are high in calories. So try and consume natural sources of MUFA-rich and PUFA-rich foods instead of other fatty foods, not in addition to them. As a rule of thumb, moderation is the key to good health!